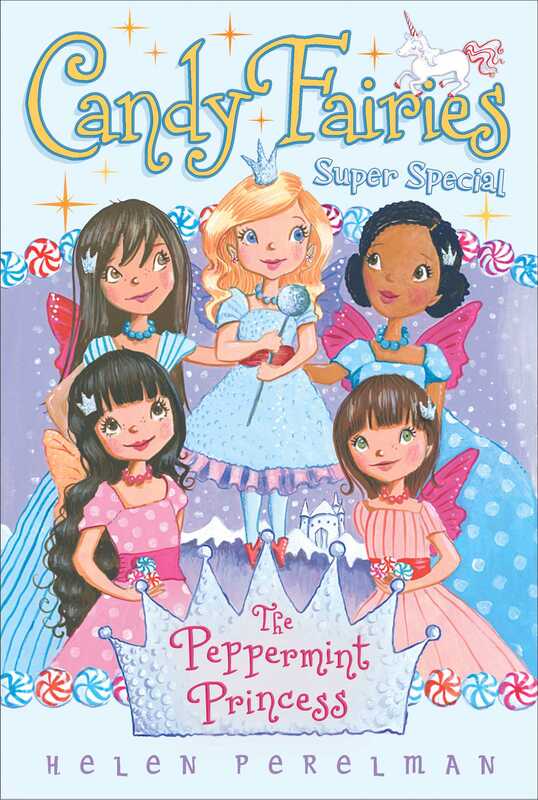 Dash the Mint Fairy discovers an ancient mint castle’s candy at the far side of Frosted Mountains and learns about a royal mint princess who left her throne for love. King Crunch will help Dash find out more about her minty past. Could she be part princess? Dash the Mint Fairy fluttered her silver wings. She was enjoying sweet treats with her Candy Fairy friends on the shore of Red Licorice Lake. The sun was sliding down behind the Frosted Mountains, and she and her four friends were happy to be together. Cocoa the Chocolate Fairy, Raina the Gummy Fairy, Melli the Caramel Fairy, and Berry the Fruit Fairy were watching the colorful Sun Dip sky. “Doesn’t the sky look like a delicious painting?” Cocoa asked. “I should try to make some gummy flowers in sunset colors,” Raina said. “Me too!” a voice said from above. The five fairies looked up to see Princess Lolli and Prince Scoop. The royal couple landed next to Berry’s blanket. “Any leftover treats for me?” Prince Scoop said, smiling. Raina made room on her blanket for Princess Lolli. “And some candy treats!” Dash added. Dash beamed. “Cocoa and I made them together,” she said. “They are fresh chocolate mint drops. Have another!” She grinned as Prince Scoop and Princess Lolli tasted the new minty chocolate treat. She could tell from their expressions that they both liked the candy. “Mint and chocolate are a good pair,” Cocoa said, winking at Dash. “You two work together well, and so does your candy,” Prince Scoop told them. “Sure as sugar!” all five Candy Fairies shouted. Raina shook her head. “We’d be happy to help you two,” she said. “Some royal business?” Berry asked. Prince Scoop nodded. “The project is in Ice Cream Isles,” he told the fairies. Dash knew Prince Scoop’s parents, Queen Swirl and King Cone, would not volunteer to help clean out an old building. They were superfancy royals, and that was not their style. “Sure as sugar, we’ll help!” Dash exclaimed. “Do you have any drawings of the castle?” Cocoa asked, leaning forward. Princess Lolli took a scroll from her bag. She carefully unrolled the plans for the new castle on the blanket. “I thought you might like to see these drawings,” she said to Cocoa. “But remember, first we need to clean out the old hall where this cone castle will be built,” Prince Scoop said. “Sweet!” Dash exclaimed. All the Candy Fairies loved Princess Lolli’s sister, Princess Sprinkle. She was a true friend to them. “You can count on us,” Raina said. “We’ll be very careful,” Melli said. “And we will ask for lots of ice cream,” Dash said, giggling. “Nothing is sweeter than a ride on a royal unicorn,” Berry said. “Sounds like we are getting the royal treatment,” Raina said. “We’re glad to help,” Dash said. She knew that she was speaking for all her friends. The sun was past the top of the Frosted Mountains, and the colorful Sun Dip sky was now getting darker and darker. The Candy Fairies cleaned up their picnic and folded their blankets. “Enjoy the ride,” Prince Scoop called as he flew back to Candy Castle with Princess Lolli. “A royally big day!” Raina exclaimed. “And we’d better all be ready,” Dash said. The five friends flew off to their beds with promises to meet back at Red Licorice Lake first thing in the morning. They knew Butterscotch would be waiting. It was the start of a royal adventure.